Former BU captain and Boston Bruins head coach Mike Sullivan has been named assistant coach of the Tampa Bay Lightning where he'll work under former Black Bear John Tortorella. Sullivan was a member of the Terrier radio broadcast team last season, teaming with Bernie Corbett and Tom Ryan. Sullivan captained the 1989-90 Terrier team that reached the Frozen Four, losing to Colgate in the semifinals, 3-2. He spent the final four seasons of his 700+ game NHL career with the Phoenix Coyotes. My decision came down to BU and Michigan and in the end, I just felt most comfortable at BU. I loved the coaches at BU and I loved the city of Boston. It was very nice getting the commitment out of the way early because it took a tremendous amount of stress off me during the season. One thing I really can't wait for is to play in the Beanpot. The tradition of BU and that tournament goes back a ways and I am looking forward to being a part of it. This blog’s focus is men’s hockey at BU but we do like to keep tabs on the fledgling women’s program that recorded 19 wins in just its second season of varsity play. Head coach and former goalie on the men’s 1978 national champions Brian Durocher announced his third recruit class featuring three highly-regarded and geographically- diverse forwards: one from Alberta, one from Wisconsin and one from Illinois. A news release officially announcing the men’s 2007 recruit class is expected to be issued shortly. Can you identify these standout Massachusetts products who all went on to lengthy NHL careers? 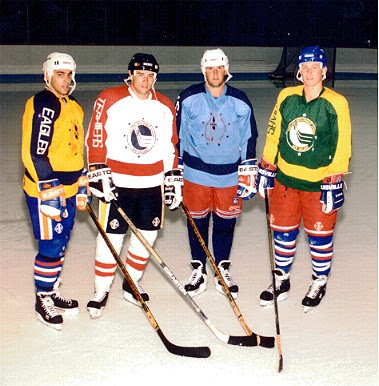 The photo is from their participation at the NECDL College Showcase Tournament some twenty years ago. The 21st NECDL event took place this past weekend. Clue: Three Terriers and an Eagle. As the NHL, AHL and ECHL continue or are about to enter their league championship seres, three former Terriers remain in the running to have their names appear on trophies. Defenseman Joe DiPenta and the Anaheim Ducks took game one of the Stanley Cup Finals yesterday against Ottawa. Chris Bourque and the Hershey Bears begin the Calder Cup Finals this week against Hamilton. Bourque had a successful second pro season, registering 58 points. Over in the ECHL, Justin Maiser and the Dayton Bombers, head into game four of the Kelly Cup finals against the Idaho Steelheads, trailing two games to one. En route the finals, Maiser’s team eliminated Mike Pandolfo’s Trenton Titans and the Florida Everblades whose roster includes Brad Zancanaro and Chris Dyment. Maiser is best remember by Terrier fans for his game winning goal in the 2002 Beanpot championship game as a freshman, and his hattrick in the 2003 Hockey East semifinal against BC, including the game-tying goal late in the third period and the game-winner in double-overtime. Matt Marshall, the subject of Friday's blog post, has committed to Vermont for 2008, when he will join his Nobles' teammate, Josh Franklin. Another highly-regarded prospect for the 2008 class, Ryan Grimshaw, has committed to Harvard. The NTDP U17 right-shot defenseman chose the Crimson over BU, Michigan, Cornell and RPI. A non-binding agreement passed last month at the coaches' convention calls for two "dead periods" in the recruitintg process during which coaches have agreed not to actively recruit or attend tournament. We're in the midst of the first period (May 15-31) and the second takes place August 4-19. This will present problems for several summer tournaments including Hockey Night in Boston's Summer Major Showcase which runs from July 29 through August 15. A Bulldog in the Terriers’ future? As BU continues to recruit for its 2008 class, one local player reportedly on the Terriers’ radar is Nobles’ right-shot forward Matt Marshall who hails from Tony Amonte’s hometown of Hingham. Marshall, who had initially verballed to Northeastern, but later decommitted, was the third leading scorer (14-10-24) for the Bulldogs, who reached the 2007 NEPSAC semifinals against eventual champion Avon (Nick Bonino). Matt Marshall plays a game based around character, energy and two-way awareness. An intense player with an excellent work ethic, Marshall may not be a huge centre but he plays a physical game, delivering a lot of hits and forechecking very hard. Very solid defensively, Marshall could become a perfect fourth line energy shut down centre. His offensive skills are not very impressive, but he is a very good skater and a hard working player who will drive to the net. Marshall had made a verbal commitment to Northeastern University, but he has decided to come back on his word and is looking at other options in Hockey East. Marshall’s current teammate at Nobles and fellow South Shore resident Andrew Glass committed to BU in January. Glass is ranked #87 by CSB. Three future Terriers played in this past weekend’s ProAm Hockey PreDraft International tournament. 2007 forward Joe Pereira (May 7 post) led his Hockey Opportunity team in scoring with 3-4-7 in four games. Hockey Opportunity was eliminated in the playoffs by ProSkills Hockey which included newest recruit Ethan Werek (May 6 post). Ethan registered two assists in the preliminary round and two goals in three playoff games. 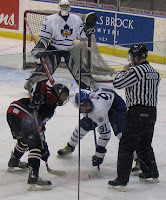 2008 recruit David Warsofsky played for Team New England, putting up four assists in four games. His Cushing roommate, member of next season’s NTDP U17s and BU recruiting target, Ryan Bourque, scored a pair of goals for Team New England. When Bonino arrives at BU for summer semester in July, we can be sure that Mike Boyle will put Bonino on a strength and conditioning regimen designed to improve his skating as he’s done for countless Terriers, such as Mike Pandolfo, and NHL players. Boyle's state of the art training facility at Agganis Arena includes a 50- yard sprint straightaway track. The American Hockey Coaches Association, facing increasing competition for talented players from the aggressive marketing tactics of Canadian major junior teams and leagues, plans to embark on its own campaign to counter what it believes is misinformation. In an effort to level the playing field for recruiting, the NCAA has approved a rule change that allows earlier contract with a prospect. According to USHR, "Under the new legislation coaches will be allowed to make one telephone call per month to a prospective student-athlete on or after June 15th at the conclusion of the player’s sophomore year in high school. A year later – on July 31st after the player’s junior year in high school – the rules revert to what is the current norm, i.e. one call per week." The Ontario Hockey League has produced a brochure that contends it offers players the best combination of hockey and academics. In the OHL, they have a tiered benefit system. First round draft picks get their tuition, books, and board covered. Second through fifth round picks get tuition and books, and everybody else only gets tuition covered. The OHL also caps expenses at $15,000 per year. We’ll follow the AHCA’s efforts are they evolve and report on them. When the Stanley Cup playoff conference finals began a few weeks back, four Terriers were still in contention to put their names on the silver cup. But the season has ended for New Jersey's Jay Pandolfo and San Jose's Mike Grier, and, as conference final play begins, that number has shriveled to just two. One, of course, is Chris Drury, whose heroics helped Buffalo eliminate the Devils. A Rochester Democrat & Chronicle feature looks at Drury through the eyes of former Terrier Assistant Coach and current Lowell Head Coach Blaise MacDonald. (Note what is either a typo or factual error). Meanwhile, a psychology professor uses Drury to validate his research about the factors that enable some athletes to thrive in pressure situations. Chris, who exemplifies the adage "success breeds success," sees these situations as challenges, not threats, according to the USA Today article. 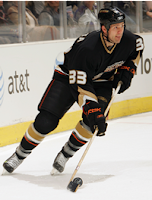 The other remaining former Scarlet skater is the low-profile Joe DiPenta, now in his second full season with the Ducks (so glad they jettisoned “Mighty”). Scott Niedemeyer and Chris Pronger are the big names on the Anaheim blueline, but DiPenta provides defensive-minded stability according to a New England Hockey Journal feature. Werek, who was the leading scorer at the OHL Cup in April and bumped up his draft status as one of the top five forwards, was on Kingston's radar for quite some time, according to Frontenacs general manager Larry Mavety. "a work ethic and anticipation second to none" in the draft. However, today’s Whig Standard interviewed Werek’s father, Zeev, who said Ethan plans to attend BU, beginning in 2009. Zeev Werek said striking the proper balance between school and hockey was the family's primary focus in choosing the school. He said his wife, who teaches English and law enforcement at Seneca College in Toronto, is determined their son get a quality education. "Education plays a big part of her life and of our family life. The unfortunate thing about minor hockey is that you can't take your full courses ... she wants school to be [No. 1] and hockey to be No. 2." Werek said he was impressed by Boston University's academic reputation as well as the school's athletics program. "The hockey program is excellent. They're really strong on the physical side." This weekend, Ethan Werek will be playing hockey in Boston. He's taking part in the ProAm Hockey PreDraft International at Iorio Arena with the Pro Skills Hockey team, made up of players from Ontario, including several of his future teammates on the Stouffville Spirit. We're trying to confirm a report that 2008 recruit Corey Trivino also will play for Pro Skills in the tournament. Two other future Terriers are participating: South Kent School forward Joe Pereira will play for Hockey Opportunity and and Cushing Academy defenseman David Warsofsky will skate for Team New England in the two-day event. For rosters, schedules and game results, go to the 2007 Pre-Draft Web site. BU rising sophomore goalie Brett Bennett has been invited to a National Junior Goaltender Evaluation Camp in Ann Arbor this weekend that will help determine the netminders for next year’s U.S. World Junior Championships team. The camp will be led by Bennett’s former NTDP coach, and former Terrier, John Hynes. The six other goalies invited are Joe Palmer (Ohio State), Billy Sauer (Michigan) Brad Phillips (U18s), Josh Unice (U18s), and Neil Conway and Thomas McCollum, both of the OHL. Bennett made one start for BU last season, recording a 2-1 win over Merrimack. When the Colorado Avs' new AHL franchise, the Lake Erie Monsters, take the ice next fall, former Terrier and 13-year NHL veteran Joe Sacco will be the man behind the bench. An assistant this past season with the Avs shared farm team in Albany, Sacco now assumes his first professional head coaching position. A 28-goal scorer on BU's 1990 Frozen Four team and a 1992 U.S. Olympian, Joe has been a monster before, having also served as an assistant when the Avs shared an affiliation with the Lowell Lock Monsters. Joe Pereira, who committed to BU for 2007 last month, was profiled in a New Haven Register feature this past weekend. Pereira, who scored 50 goals in his two seasons at South Kent School after playing at West Haven H.S., is one of three forwards from Connecticut headed to BU this summer to take classes and enroll in Mike Boyle’s workout regimen. Next weekend, however, Pereira will be playing for Hockey Opportunity in the Pro-Am Hockey’s Pre-Draft International event (click on 2007 Pre-Draft Int.) at Foxboro and at Iorio Arena in Walpole. He’s joined on the roster by his South Kent linemates, Nick Lampson, a Colorado College recruit, and Rem Vanderbeek, whose father owns the New Jersey Devils. Several other Terrier recruits may be skating at the same event. Team New England, whose roster has yet to be posted, sent invites to Nick Bonino, Andrew Glass and David Warsofsky, and we’re looking into a tip that newest recruit Ethan Werek will be there, too. BU has landed an important new recruit for its 2009 class and he’s a first round OHL draft choice. Toronto Marlies AAA forward Ethan Werek (6/7/91 birthdate) was chosen ninth overall by Kingston in yesterday's OHL draft, but has instead committed to BU for the 2009-2010 season, joining Chicago Steel defenseman Max Nicastro (2/28) in that class. Werek, a 6’1” 170 left-shot center, will spend the next two seasons with the Junior A Stouffville Spirit of the OPJHL, a team co-owned by his father, Zeev. 2008 recruit Corey Trivino played for the Spirit last season, earning conference Rookie of the Year honors and has one more season with them before arriving at BU. Werek’s line for the Marlies was 59-69-128 in 55 games. He also was the leading scorer during the recent OHL Showcase Tournament with 7 goals and 8 assists in 7 games. There's a new addition to our sidebar list of blogs. It's called "College Hockey Blogs--Your favorites all in one place." This blog lists clickable headlines from posts on 38 different college hockey blogs--this one included. It's any easy way to access those blog posts you may find to be of interest--for example, Teddy Purcell's defection to the pros and the NCAA's release of Academic Progress Rates (APRs). Blog reader slik4 brings to our attention a connection between the #20 ranked BU women’s lacrosse team (which beat UNH tonight to advance to the America East final) and college hockey. Freshman attacker Jenny Taft from Edina (Justin Maiser’s hometown) is the daughter of former University of Wisconsin defenseman John Taft, who played on NCAA champions in 1973 (Boston Garden) and 1977, and later in the NHL. Jenny was also an all conference hockey player in Edina. Stop me if you've heard this before. Chris Drury scored a critical goal tonight in a Stanley Cup playoff game. Yes, for the umpteenth time, Captain Clutch came to his team's rescue. In game 5 of the Conference semifinals between Buffalo and the Rangers, Drury's scored with 7.7 seconds left in regulation to tie the game and keep the Sabres from falling behind in the series, 3-2. Instead, Buffalo won in overtime, 2-1, and can close out the Broadway Blues in game 6. For Drury, who has 14 career playoff GWGs--4 of them in overtime--, this was the first post-season game he's sent to overtime. When John Curry receives his diploma later this month, his family will have no problem deciding on the appropriate graduation gift. What "Johnny B. Good" needs most is a trophy case. 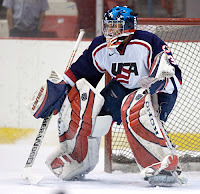 A 2007 Hobey Baker Award finalist, he also was the recipient of first team RBK All-American honors, the Beanpot MVP and Eberly Awards, New England's Most Valuable Player Award, the Walter Brown Award for best American-born college hockey player in New England, the Hockey East Player of the Year Award, the ITECH Goaltending and Three Star Awards and the George V. Brown Award as BU’s MVP. At last Monday’s BU Annual Student Athlete Awards Reception, Curry added another pair of honors. He received the Mickey Cochrane Award as BU male athlete of the year and the prestigious E. Ray Speare Award for top male scholar-athlete. Curry earned a 3.5 GPA in the fall of 2006 to earn a spot on the Dean’s List and also boasts a 3.1 cumulative GPA. Curry is the first hockey player to win the Speare Award since Shawn Ferrullo did so in 1997 and Jacques Joubert in 1995. Previously Terrier pucksters to win the award include Chris Matchett, Terry Meagher, Bill Burlington, Steve Stirling, Larry Davenport, Brian Gilmour, Don MacLeod and Paul Whelan. Note: Yes, the photo above is from 2006 not 2007, but it certainly is a memorable one. David VanderGulik played all 80 games this season for the Flames’ farm team, the Omaha Ak-Sar-Ben Knights, indicating his injuries are all behind him. Vandy finished fourth on the team scoring chart with a 16-27-43 line and his +27 was best on the Knights. Carl Corazzini had another strong season for the Chcago’s Norfolk Admirals AHL club, scoring 28 goals and 27 assists and adding four more goals in six playoff games, which earned him a seven-game call-up to the BlackHawks. 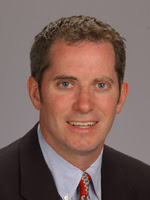 Dale Dunbar, who played four seasons on the Terrier blueline in the early 1980s, is a high school coach in his hometown of Winthrop and also a scout and recruiter for The Bobby Orr Group. The Salem News suggests he’d make a good candidate for the vacant head coaching position at St. John’s Prep in Peabody (where current Terrier John McCarthy starred in hockey and football). Je me souviens, the official motto of Quebec, means "I remember." Perhaps BU's coaches remember the contributions of Quebecois such as John Bethel and Bob Boileau--members of the 1978 national championship team--and going further back blueliner Mike LaGarde, All-American Mike Hyndman and "Pinball Line" sniper Serge Boily, because they're looking again to the Eastern Canadian provinces for recruits. USHR reports that BU is "very bullish" on 5’10½”, 157 lb. right-shot center Louis Leblanc of the Lac St-Louis Lions of the Quebec Midget AAA league who is ranked #2 overall in the upcoming QJMHL draft. Expected to play for former Terrier Dan Donato at Salisbury next season, he has already received offers from Vermont and Clarkson for 2009. BC also has interest in Leblanc, who is described as a "dynamic forward with speed, competitiveness, hands, and an edge to his game." In 40 games regular season games, he had a 31-18-49 line and added 14-7-21 in 22 playoff games. BU also will contend for the #3 ranked player in the Q draft, Steven Anthony, a 6'2", 190, left shot power forward for the Dartmouth Subways of the Nova Scotia Midget League, who rang up 31-33-64 in 35 regular season games. Anthony played for Holderness in 2004-05 and returns to the prep ranks next year at Lawrence Academy. He made an unofficial visit to BU last month when he toured Lawrence.Competition for the highly regarded native of Halifax, N.S., should include BC, UNH, Maine and Vermont. 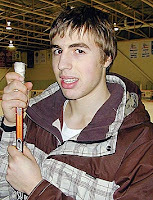 Anthony, who played for the 2007 Nova Scotia U17 team in the Canada Games, is likely a 2009 recruit, but could accelerate for 2008.